Meera Hemant Patel and Trevor Logan Burbank were married April 12 at Bicentennial Capitol Mall State Park in Nashville. Bob Mendes, an at-large member of Nashville’s Metro Council, officiated. The bride, 31, is an illustrator and writer based in Nashville. She is the author of “My Friend Fear: Finding Magic in the Unknown” (Penguin Random House, 2018). She graduated from Rutgers. She is a daughter of Bindu Hemant Patel and Hemant Manubhai Patel of Sayreville, N.J. The groom, 29, is the city pricing manager for Opendoor, a real estate technology start-up company in Nashville. He is also the board chairman for Nashville’s affordable housing nonprofit New Level CDC. He graduated from Vanderbilt. He is the son of Diana De Alejandro Burbank and Richard D. Burbank of Dallas. Ms. Patel and Mr. Burbank met on Coffee Meets Bagel in Nashville in May 2017. 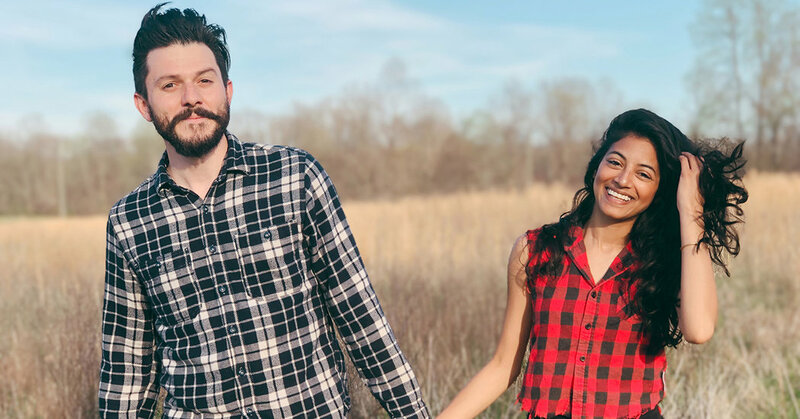 Ms. Patel, still reeling from the breakup of a one-year “terrible relationship,” as she called it, was in the midst of an eight-month solo trip around the country in search of herself. That left the door slightly ajar for Mr. Burbank, a native of Dallas who had lived and worked in New Orleans for the better part of a decade. They agreed to meet and go for a hike at Shelby Bottoms, a nature preserve in East Nashville. He offered to pick her up, but she politely declined, choosing instead to get there by taxicab. Mr. Burbank tried to impress Ms. Patel with his familiarity of the trails at Shelby Bottoms, but they got lost in the woods for four hours. Ms. Patel became frustrated, but rather than tell Mr. Burbank to take another hike, she decided to stay the course, and they went to Rosepepper, a Mexican cantina in East Nashville, where they drank margaritas and shared a meal during what turned out to be a very successful nine-hour first date. They dated for the duration of May before Ms. Patel continued on her journey to Chicago, Utah, Arizona, Los Angeles, San Francisco and Vancouver, British Columbia. She briefly returned to Nashville to visit Mr. Burbank, and then went off to complete her trip, visiting Chicago again and then North Carolina and New Jersey before returning in October 2017 to Nashville, and Mr. Burbank, for good. In April 2018, the couple bought a farm in Nashville, which they share with five chickens, a Border-Collie mix and visiting wild turkeys, coyotes, raccoons, vultures and hawks.